I don't know about you, but I don't have much time in the morning which means I have little room for error when getting dressed. What I mean is, if I throw something on and it doesn't work, I don't have a lot of time to try something different and debate the pros and cons of my ensemble. Therefore, over the weekends I am known to put a few outfits together in advance so I am prepared and ready to go for the weekdays. My husband laughs at this behavior, but I find it to be quite practical and time-saving. I also usually check the weather when I am putting stuff together ahead of time so I know what to dress for, but sometimes the weather takes a sudden turn. Either that or the weather people just don't know what they are doing. It's probably a little of both! Well, today was one of those days. I thought the weather would be balmy and sunny, but it was overcast and cool. In fact, it was even drizzling just a touch this morning. I had planned to wear this cute H&M pleated skirt and short sleeved sweater today and I already had it on when I realized the gloomy conditions outside. 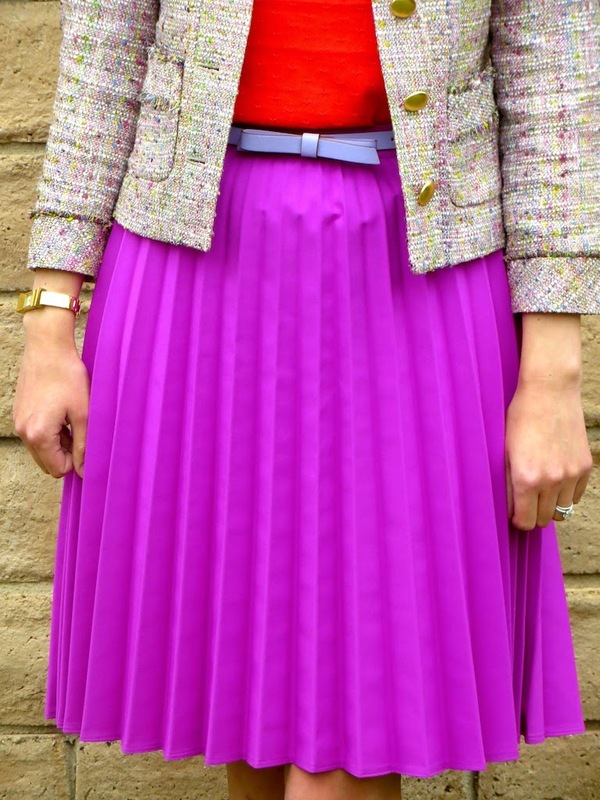 So, in a pinch, I found this Channel inspired boucle jacket from J. Crew in my closet and threw it on for a little warmth. It turned out to be just the perfect solution to the pinch I was in! So now on to the potstickers or gyoza if you want to get a little fancy. (I opted for potstickers to make for the alliterative title of this post.) While I usually like to plan out a menu and make things from scratch, nothing beats the ease of pre-made appetizers when you're in a pinch. These are actually from the 99 Cent Only store and they are so yummy you won't realize you're eating on a budget. I am actually a pretty big fan of shopping at the 99 Cent Only store, especially for produce. A girl has to save for shoes you know! 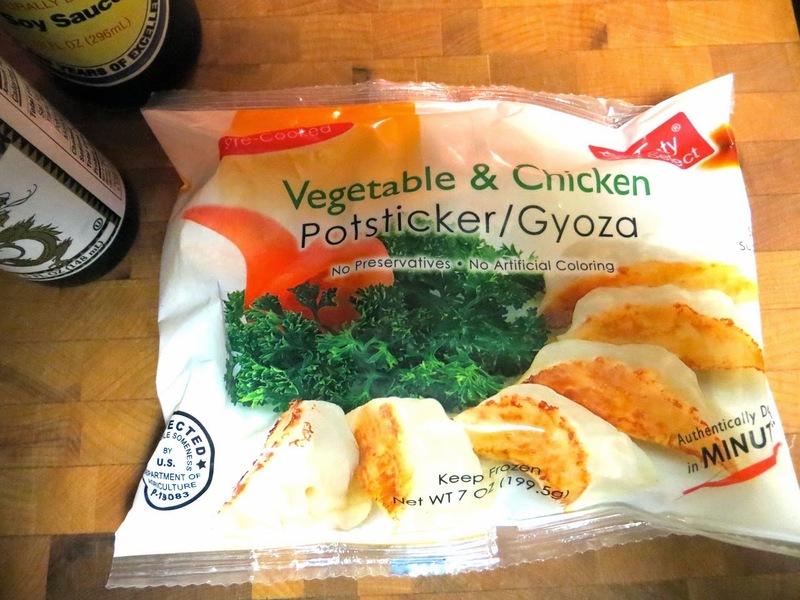 I was first tipped off about these vegetable and chicken potstickers by the 99 Cent Only Chef Blog. He claimed that they were better than those put out by Trader Joe's and I think he just might be right. Actually, I would go so far to claim that they are better than the ones I get at the Japanese restaurant near me when I get a three item Bento box. After gathering your ingredients together, combine by whisking together with the pepper flakes. I got this recipe also from the 99 Cent Only Chef and it turned out to be a savory yet simple dipping sauce for gyzoa, dumplings or potstickers. After preparing your dipping sauce you can start to pan fry the potstickers. I used a liberal amount of oil because otherwise they will truly stick to the pot, thus living up to their name and leaving you with a mess to clean. (Luckily my husband does the dishes, but I try to make things easy on him.) If you want to be healthy you could also steam the potstickers, but nothing compares to that crispy outside that develops while frying. When you are done with pan frying, be artistic and arrange the potstickers around the dipping sauce to make any design you please. I thought this would be a nice combination with the yellow dipping bowl and black and white serving plate. Now dip and enjoy! Yummy and perfect, not to mention cheap in a pinch! I also paired these as the appetizer to accompany some hot and sour soup, shown below. More yum! You could order takeout, but it's also fun to experiment at home. Potstickers: Check a 99 Cent Only Store near you! ...Holy cow, now I want potstickers! Hah! Thanks for the sauce recipe, and glad you are looking bright and cheery during your not so nice weather. Thanks Laura! Potstickers are one of my favorite appetizers. I think I am going to be buying some more at the store today if they still have them! Ooh, I am loving the skirt! And mm, mm, hot and sour soup is one of my faves! Do you make your own? Thanks Lisa! The soup broth is from Swanson and then I add my own ingredients and a few things to the broth. It's a pretty easy way to whip up hot and sour soup if at home if you don't feel like picking up takeout.